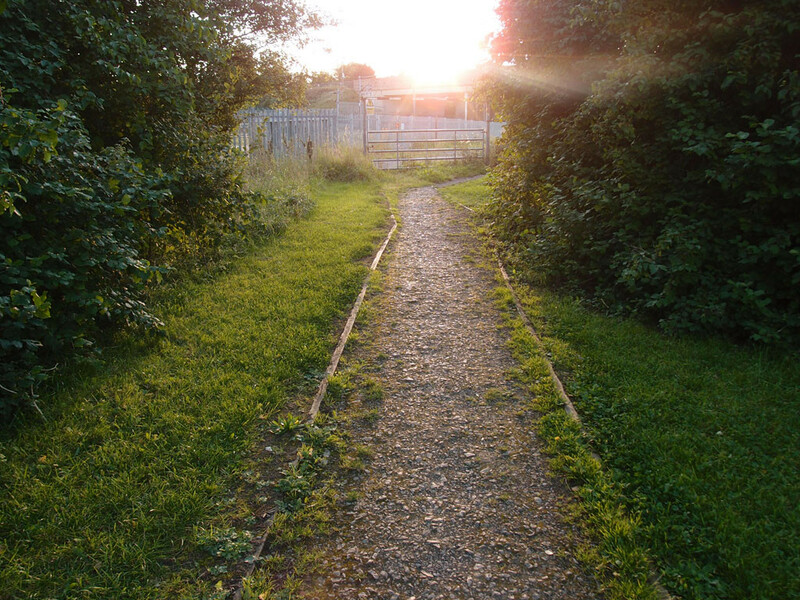 Pictured above is Leeman Road Millennium Green, off Water End, on a June evening last year. 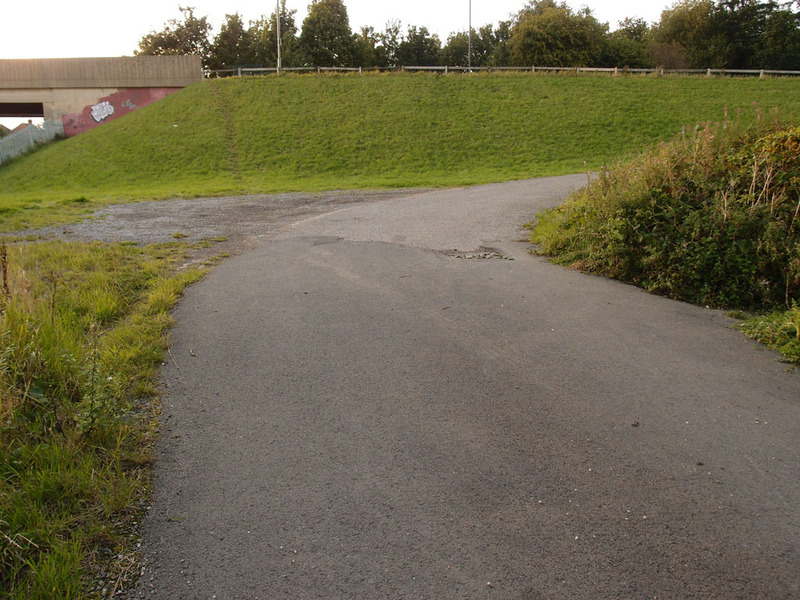 As mentioned on the previous page, two of the options for the access road to York Central put this place under threat. From the available information on the consultation website it looks like one of them, ‘Western 01′, is less damaging than the other (Western 02). Western 01 stays nearer the edge of this charming green space, Western 02 appears to go through the middle of it, which presumably would destroy much of what you see in the photos above. 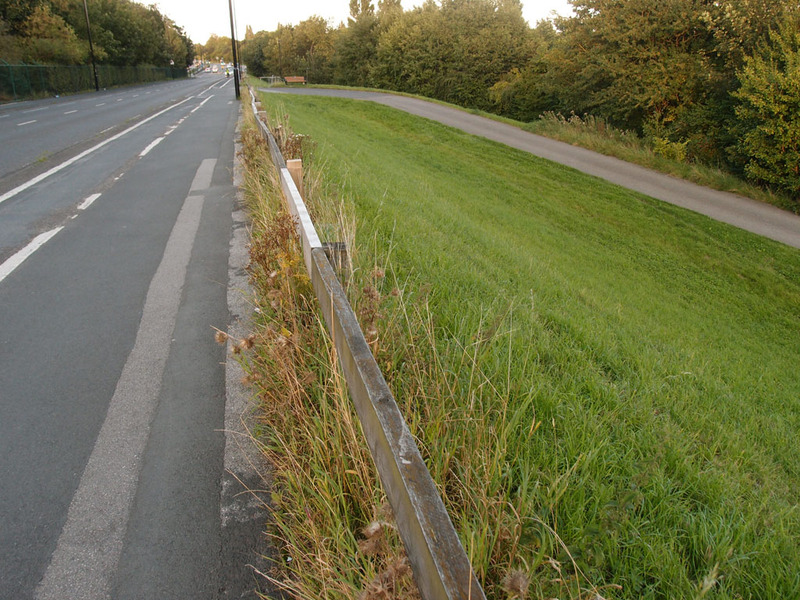 There has been local media coverage of the York Central access road consultation, but I haven’t seen online any attempts to look more closely as this place under threat. I thought someone should attempt to represent the place and its charms. I cycle past regularly, and I’ve walked through it a couple of times before, but went up to Water End again yesterday evening to take more photos and try to picture how the proposed road options might work. 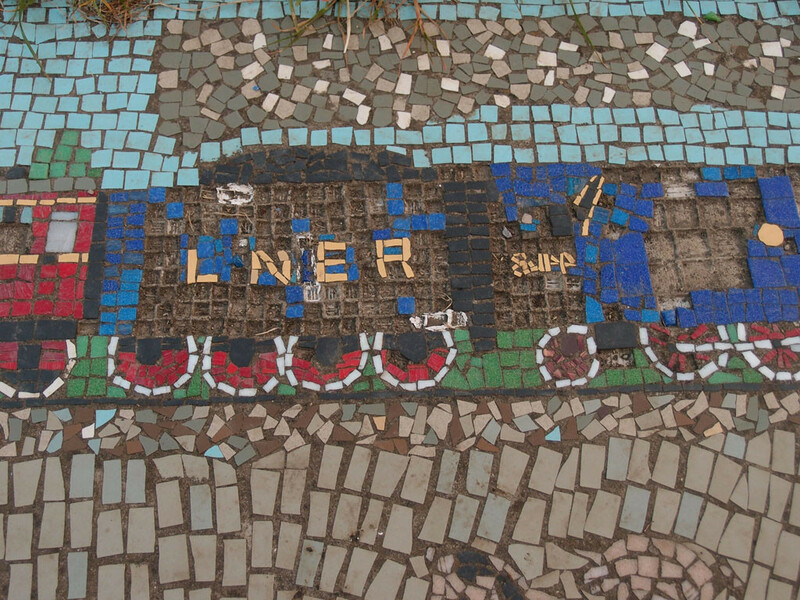 The photo on the previous page was taken from the bridge over the railway lines on Water End. Apparently it’s called Severus Bridge – I never knew this, until compiling this page and looking at a few old maps. Moving to the left a bit gives us a better view of more trees, the edge of the Millennium Green. There’s a short stretch of road here, leading down to the railway lines, presumably just a service road for Network Rail. But it’s also one of the ways in to the green space known as Millennium Green, so I headed that way. 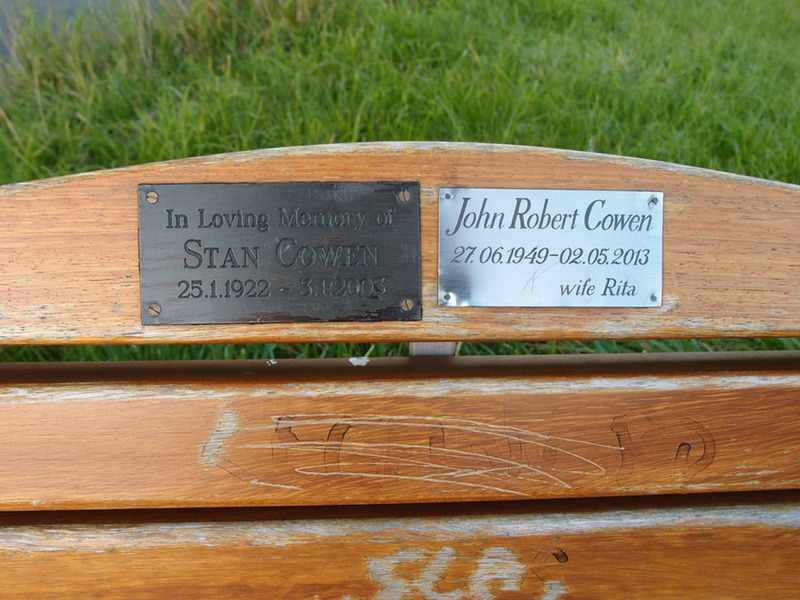 There’s a bench here, with plaques. I hope that if the access road does start here someone will carefully relocate it to somewhere suitable. Down by the railway lines at the bottom of that short stretch of road there is quite a large area alongside Millennium Green where there’s nothing much of interest. Here we’re looking back to Severus Bridge and Water End. 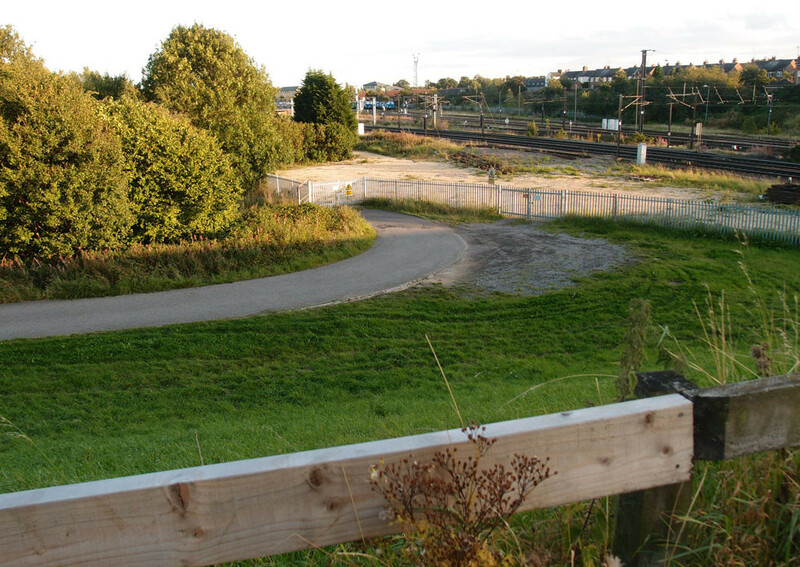 The York Central access road option called ‘Western 01‘ is shown in the plans in roughly this location. 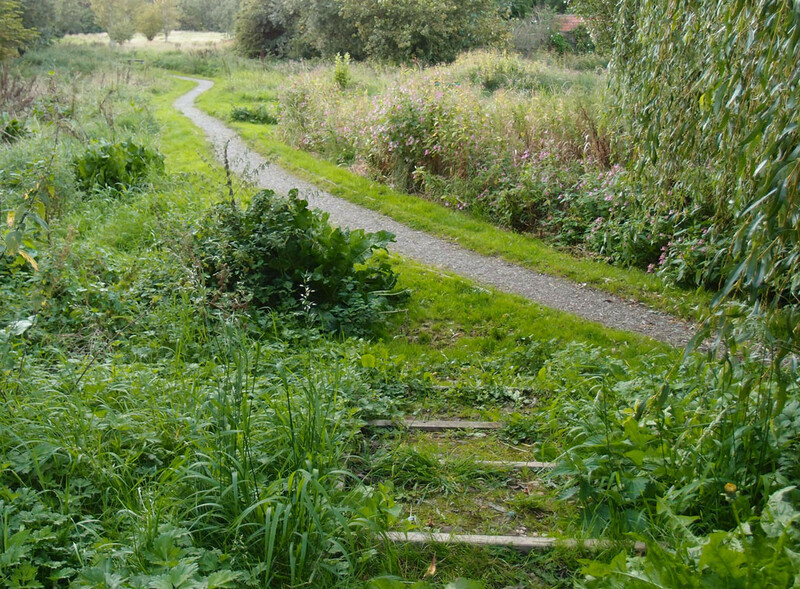 If this route was selected there would be some damage to Millennium Green, as presumably some trees and other vegetation would need to be removed in this area near the rail lines, but the impact would be less damaging than the ‘Western 02′ option. Western 01 would cost more than the other options, but then there are different types of ‘cost’ to consider, environmental costs perhaps. 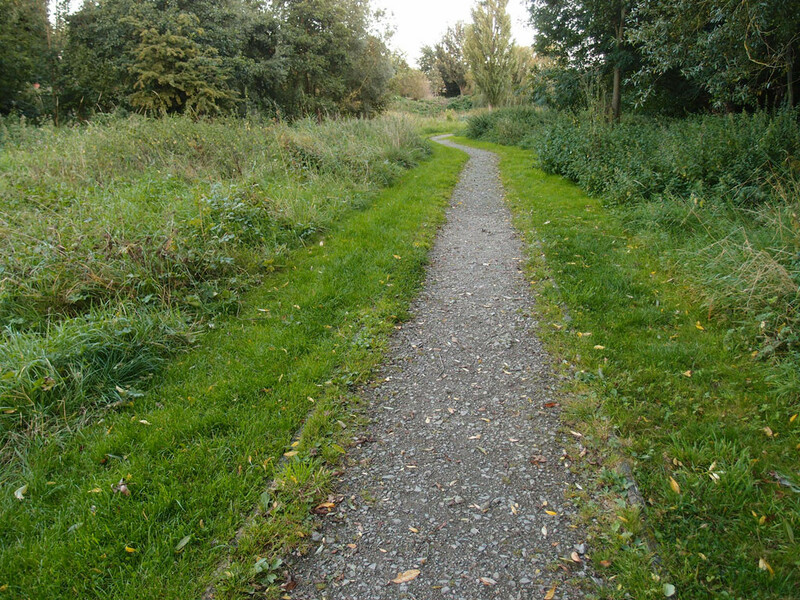 There’s a track down here leading into Millennium Green. At its entrance is a dog poo bin, one of those unattractive necessities, so it doesn’t look that promising at first. But I turned round and looked back, and got this photo, as the evening sun sank a bit lower, behind Severus Bridge. 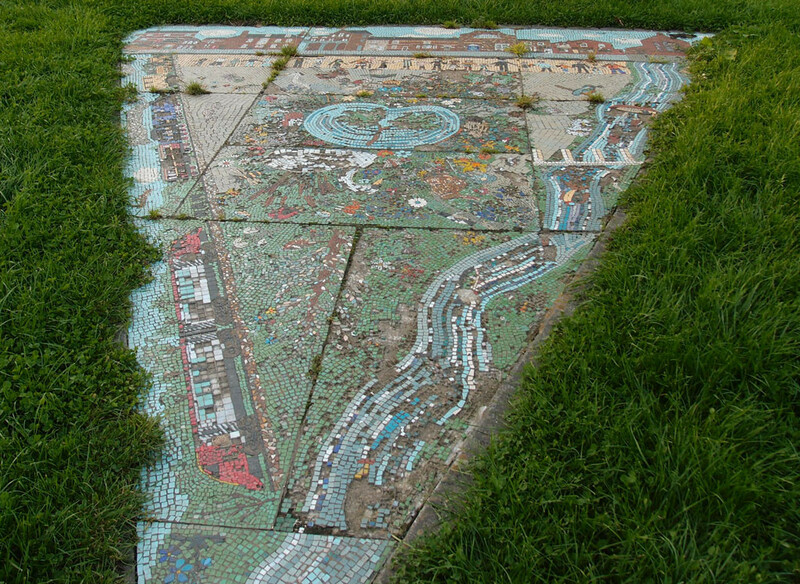 We arrive on an area of grass with a large triangular mosaic. 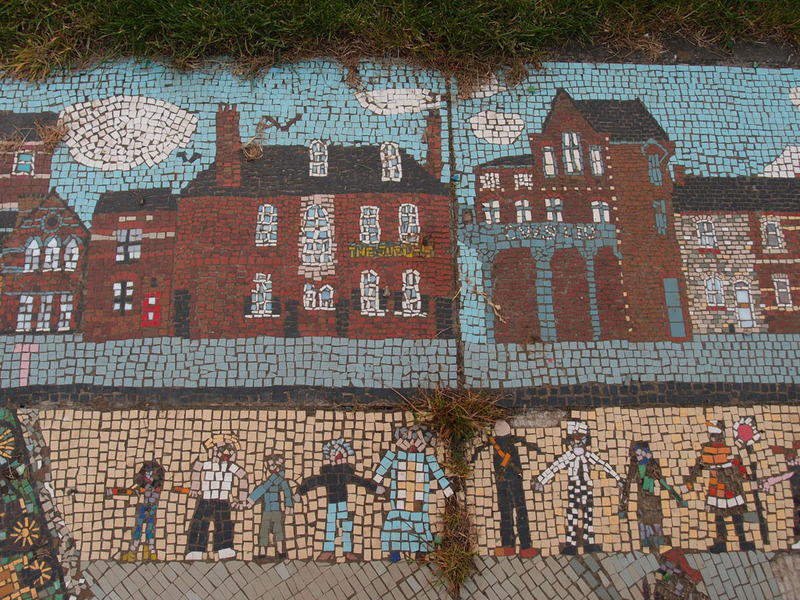 The information for the York Central access road consultation mentions this mosaic, that it may be damaged by the access road ‘Western’ options. To be fair, it’s showing quite a lot of damage already, presumably from weathering over the years. But it’s still a delightful piece of work, representing flowers and wildlife but also specific and recognisable local buildings. And railway carriages too. While you’re down here in Millennium Green the sound of passing trains is a regular feature. It’s not clear how much of Millennium Green would be lost if ‘Western 02′ access road option is chosen, but it looks from the plans as if the road would destroy much of it. 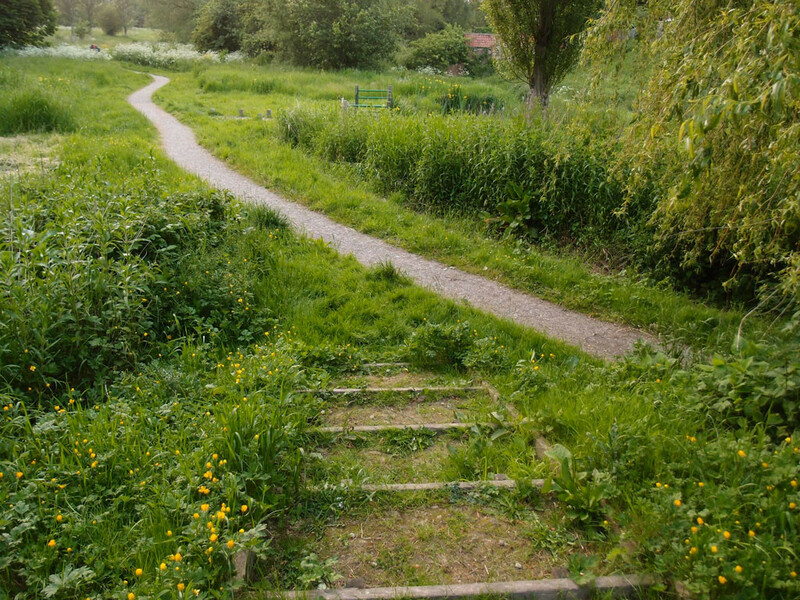 The path through the green area leads to a small bridge over the beck and round to the corner near the houses of Garnet Terrace, which marks the edge of the built-up Leeman Road residential area. Most of the houses in the area are small terraced houses with yards, not gardens, so this is their green space. I headed back towards Water End along Garnet Terrace. 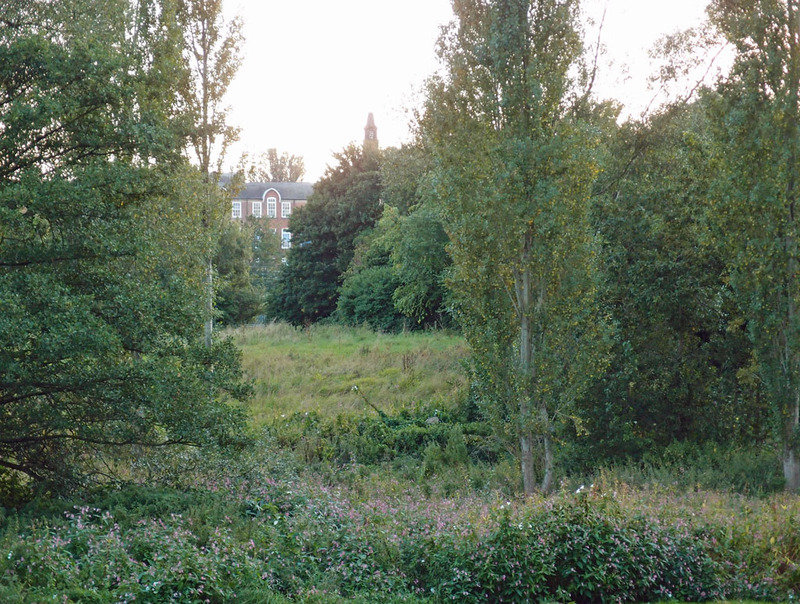 Presumably that side of the Millennium Green, nearer to the houses, would be retained even under the ‘Western 02′ option, but a much smaller part of it. 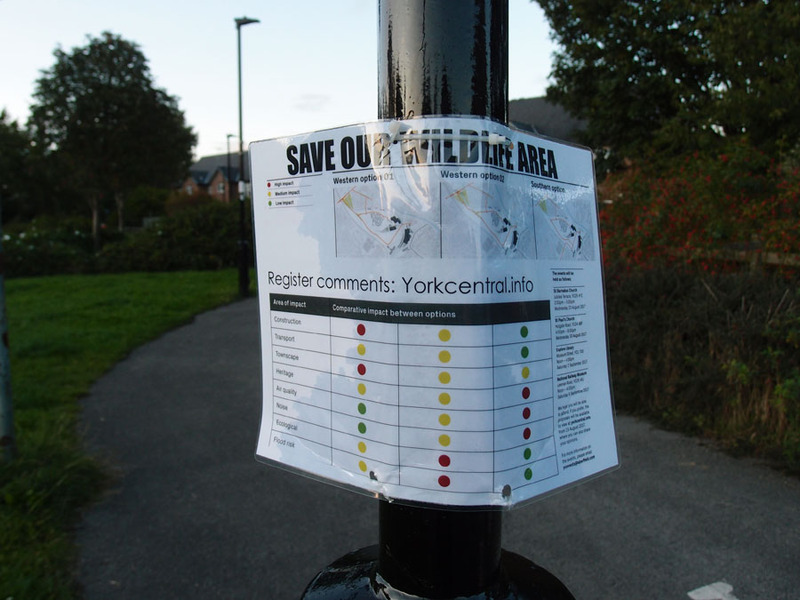 Obviously the residents are worried about the threat to their wonderful green space here, as a notice on a lamp post at the edge of it made clear. The light was fading, time to head home. Just before I got back to the main road I looked across Millennium Green and admired the handsome Poppleton Road School, a bit of it visible through a gap in the trees. And I wondered how many of these trees would survive the construction of the York Central access road, if Water End is where it ends up being. There’s more on the consultation and how to add your comments on another page I’ve just added to accompany this one. There’s also a Google map to show the location. The consultation on the access road options closes soon: 13 September 2017. For notifications of new pages appearing here on York Stories join the mailing list or follow me on Twitter. ‘But how can I express my appreciation for this wonderful online resource?’, you may be thinking. If you’ve found these pages useful and appreciate the time and effort that goes into compiling them virtual coffees are appreciated.